Pop Fiction’s pricing depends on many variables including date, location, size of the venue, and various services. Please contact us, give us the details, and we’ll be happy to give you an accurate quote over the phone or email. If your event is a non-proft fundraiser or a city-sponsored event on a tight budget, Pop Fiction will work with you to provide a discounted rate that will help you reach your financial goals for your event. Pop Fiction has played several hundred weddings - indoor, outdoor, big, small, calm, and crazy. A wedding is quite possibly the most special and most complicated event you can ever plan, and the choice for entertainment, or lack there of, can make or break your wedding. Pop Fiction is a full-service production company that can provide sound system, lighting, and stage for any size event. They will work with you and your wedding planner every step of the way during your many months of planning to ensure your special day is as special as it can be! The band members will also gladly take on the emcee duties and make any announcements at your event. Pop Fiction proudly supports marriage equality. 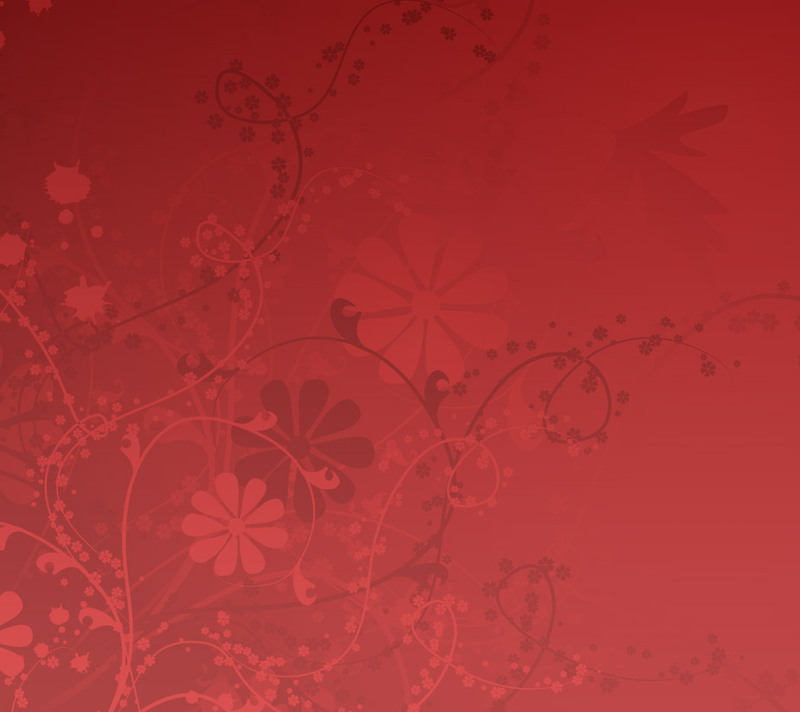 Pop Fiction will work with you to ensure the song list for your event will be best suited for you and for your guests. Please feel free to select your favorite songs in advance from the band’s song list and they will make sure to play them. You are also welcome to provide the band with a list of songs to omit from their set list.! And of course Pop Fiction will never use any profanity in their lyrics at any time during your event. Pop Fiction's attire is completely customizable for your event. Pop Fiction’s standard costuming is dressy, current, colorful, flashy, and cool. We welcome any suggestions about colors and themes so the band’s costuming will accent the décor of your wedding or event. If the theme of the night is Disco or 80s, Pop Fiction will gladly hit the stage decked out in their loudest sparkly disco or 80s costumes. If your event is very conservative, Pop Fiction cleans up nicely in formal black suits and dresses. 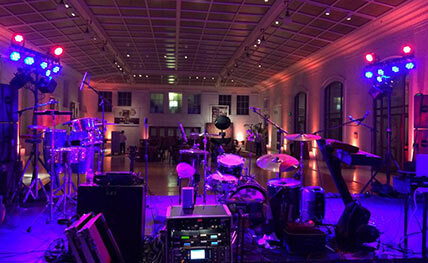 Pop Fiction will provide a professional sound system and stage lighting for your event. 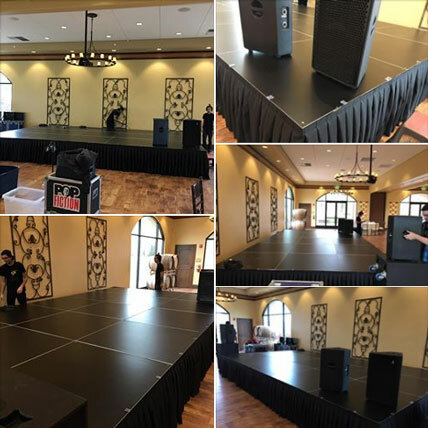 The sound system we supply is always available for you to use for speeches, presentations, and background music throughout your event. The band's sound engineer will be on hand throughout the night to assist you in any way possible. Pop Fiction also supplies an ipod with several hours of background music with playlists created for jazz standards, R&B, Disco, 80s, and current club hits that the band’s sound engineer will gladly play before the band plays and during the breaks. You also welcome to supply your own Ipod, ipad, laptop, or smart phone for break music. Don't put the band on the floor! Pop Fiction can supply a profesional customizable stage for your event. Sizes up to 12' x 24', and a height of either 16" or 24"...perfect for any size venue. 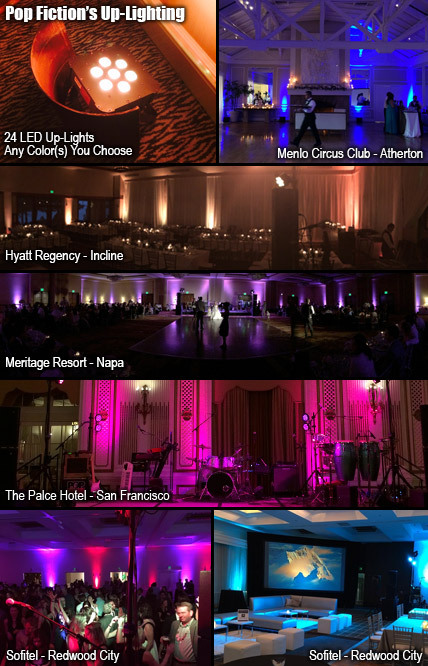 Transform your venue with Up-lighting. Pop FIction can provide up-lighting to add soft color and ambience to the walls, beams, and foliage at your venue. We will supply, set up, and program 24 state-0f-the-art LED up-lights capable of producing virtually any color. Don't leave your guests in the dark! 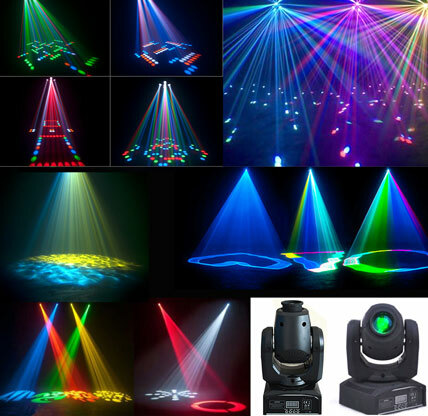 Pop Fiction can provide a variety of state-of-the-art computerized moving dancefloor lights, LED projection effects, moving-head gobo spots, water-based hazers, and lasers to liven up your dance floor and giving your event an exciting nightclub feel. Your event is another state? No problem! Even though Pop Fiction is based in Northern California, it is easy to fly the band in and simply contract a local production company to supply the band’s larger backline equipment (drums, amplifiers etc.). Pop Fiction has played countless fly dates over the years. The band’s management will take care of all the details every step of the way to ensure that the show goes off without a hitch. Pop Fiction carries a liability insurance policy. If your venue or planner requires insurance, we can have our insurance agent generate a certificate of insurance naming the venue, the date of the event, and additional insured. My department at Google hired Pop Fiction for a party; they brought down the house! People were literally chanting "ONE MORE SONG!" at the end of their 3 hours on stage. Their set list was a great mix of old and new songs to please a diverse audience of several hundred individuals from the US, Ireland and India. They were great to work with from the logistics perspective as well -- communicative via email/phone, organized, professional, and appropriate. Such a fun show and positive experience overall -- would definitely recommend! The best wedding band they’ve ever seen. The wedding was truly the most magical, amazing day of my life. I can’t stop smiling. You and the band were perfection – everyone keeps saying how Pop Fiction is the best wedding band they’ve ever seen. Mike and I had the most amazing time dancing the night away to all of the 80s tunes. So much fun! I am on a permanent high. I can’t thank you enough for everything you did. You made my vision, my dream wedding come to life. Thank you from the bottom of my heart. Karen and I wanted to take a moment to thank you and the band for such an incredible night at our wedding on September 27 at the Carneros Inn. We had THE BEST wedding (yes, I’m partial ;) and you helped make it a fantastic party!! You and your band's attitude, energy, attention to detail, extreme talent and heartfelt care came through so clearly and made the night a rockin’ great time!! Everyone who came (many of whom are very seasoned party, Bar/Bat Mitzvah, wedding attendees) said you were THE BEST band they have every heard at any event anywhere…we couldn’t agree more!! We passed along your name and contact info to many guests and I hope that manifests into opportunities for you to share all your incredible talents with the world. Again, thank you for all you did to make our wedding so fantastic! We wish you all the best! If I could give Pop Fiction Live 6 stars, I would. We hired them for our wedding and they were THE BEST. I had very high hopes because they had been recommended by three of my friends (one in the music industry in LA). And they exceeded all of my expectations. Dan was a pleasure to work with and very professional. He worked with us to select the songs and also gave insights in terms of the timeline of songs, types of songs, etc. All of my guests were so impressed with the number of singers, musicians and how they complimented each other. Although we used them for our wedding band, I think that they would be an asset at multiple types of events. They sing a wide variety genres so it was nice to be able to have the multiple generations enjoying themselves on the dance floor. The quality of their voices/instruments was impressive and honestly, I can not recommend them enough and you definitely get more than you pay for. I opted to have Dan MC and have the additional backlighting, which I am very glad I did as the stage looked awesome. I hope that I am able to throw another event in the future and hire them again. Best night we could ever have hoped for! I don't have the words to sufficiently thank you for the amazing job that you and the rest of your band did at our wedding. Max and I have been to a zillion weddings in the past couple of years and we agree that your performance was absolutely the best we've seen. And the fact that the dance floor was full all night long is just a testament to your quality. Every single person in your band is exceptionally talented. We have no idea how you could perform a Ke$ha song and make it sound like Ke$ha and then perform a Dolly Parton song and make it sound like Dolly! Thank you so much for contributing to the best night we could ever have hoped for! If you want me to write a review on any particular website, please let me know and I would be happy to. How can we begin to say thank you? You all far exceeded our expectations - thank you! Thank for a fantastic performance and constant positive energy - Pop Fiction made the night, hands down amazing! We are still receiving praise on your behalf days later. Dan, just wanted to send a quick note before we leave for the honeymoon and say thank you times a million for the amazing party last night!! Sean and I both said we never expected to have so much fun dancing at our own wedding :) The compliments have been poring in and it was so incredible to see our guests partying on the dance floor all night long. Thank you for everything and please tell the rest of the band how much we appreciate it! Pop Fiction just played my wedding on Saturday and I cannot say enough good things about them. First, as bride planning a wedding from a different state, they were extremely responsive and easy to work with which is a huge plus. And then on the day of they absolutely KILLED IT! Our first dance was Ray LaMontagne's "Your are the Best Thing." I was worried about a cover version because I love his voice but they really pulled it off and I couldn't have been happier. They kept my guests dancing all night long, completely stuck to my requests as far as "must plays" and "do not plays" and in short, MADE MY WEDDING RECEPTION! My only regret is that I was so busy greeting guests I didn't get as much time on the dance floor as I would have liked. Thanks Dan and crew!!! Dan, you guys were AWESOME on Saturday!!!!!!!!!!!!!!!! My wife (and everyone at the party) loved you guys. If anyone is questioning the decision to hire you, please give them my number. Thanks for making the party a very memorable experience for all of us, the music was amazing. Your range of music is unbelievable and is was all HIGH QUALITY. Letting the kids sing a few songs with your band was priceless. I wanted to thank you, thank you, thank you for making our wedding reception so spectacular! We were absolutely overwhelmed by your band's talent--I think I have heard from every one of our guests that yours was the "best wedding band ever!!" and "the most fun ever!!" Brandon and I feel the same way and are likely your biggest fans. We could not have been happier with the evening--I only wish the venue would have let us stay longer, b/c we were not ready to go! From the cocktail hour, to California Stars (played perfectly! ), to Journey, to Pink, to 2Pac & Dr. Dre--you guys (and gals) were absolutely amazing. We were all blown away by the diversity of music and the perfection with which you played everything. I was thrilled to see everyone on the dance floor having the time of their life, and I give you 100% of the credit for that! I hope you enjoyed our crew and the venue as well. In our opinion, the night could not have been any better! It was an absolute pleasure having you, and thank you so very much again! Our wedding was so much fun and Pop Fiction was such a huge part of that. Such a great night and we're so happy and grateful you guys rocked the house. So many people throughout the night and over the last few days have just raved about how great you guys are. Best band ever! Your music was simply fantastic! We can't thank you and your wonderful band enough for making our son Jeremy and daughter-in-law Meganne's 11-11-11 wedding at Hans Fahden so ridiculously amazing. Your music was simply fantastic and everyone loved it. 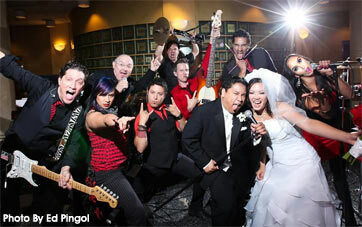 I know how much Jeremy wanted a real "party" band and not a typical "wedding" band, and that is exactly what he got! You performed so well in that somewhat confined space, but it seemed to work out very nicely. Everyone is raving about you!Thank you so much! I will highly recommend you to other friends who are going to have a party or wedding. You guys were fantastic!! We had high expectations and you totally rocked it! Thanks for making the night such a memorable one for us!! We wanted to thank you and your band again for the performance. You guys kept the party rocking all night and I didn't see the dance floor empty once! We had an absolute blast as well and couldn't be happier about selecting Pop Fiction for the wedding. All of our guests absolutely loved you guys. I knew I wanted a band at my reception. I also knew I wanted a band that played manyl different types of music--70s and 80s, new hits, a little bit 90s...just the type of music that makes everybody want to dance. I started my search for live music and was only coming up with bands that had really small playlists (or had a really cheesy feel about them). And then I found Pop Fiction. Oh what a wonderful day. Their song list was endless. And what's even better is they sounded incredible. I listened to a few of their tracks online and was sold instantly. I gave Dan a call and immediately had a good feeling about the band and their professionalism. Dan was quick to respond to all of my questions and called/emailed every couple weeks in the months leading up to the wedding to ensure everything was set. The wedding day came, we made our toasts, and it was time to party. Pop Fictoin started playing....and the dance floor was packed. I mean it was packed the entire evening. We had 20-90 year olds dancing to "OPP". What's more fun than that? My wedding was over a year ago, and I still have people telling me "that band was amazing!". They MADE the reception. Book Pop Fiction if you want happy wedding guests, a packed dance floor, and one big party. Thanks again for having the perfect band for the party! Just wanted to drop you a note to say thanks so much for a great evening of fun music and lots of dancing. Appreciate all that you did to make the venue work and hope that you get more events there as you proved that you could work within their space. Kelley and Jeff and all of their friends thought you guys were phenomonial !! It was obvious when the party ended - they didn't want to go home. Kudos to you and your band. Pop Fiction did an outstanding job! From our first meeting, to the contract, to the actual event...you are awesome to work with. Pop Fiction did an outstanding job! Everyone had nothing but great things to say. I appreciate the way you were so flexible with our schedule. We're just home from honeymoon and are still grinning from ear to ear when thinking about the dancing at our wedding...Pop Fiction was truly off the hook and we were thrilled with the fun! I Can't tell you how important it was to us that you rocked the house, Thank you! Everyone was talking about you all on Sunday, and now that we're home i suspect we'll be hearing more and more about how much fun it was to dance. They had amazing sound quality and a great repertoire of songs. The dance floor was packed all night and we got a ton of compliments from guests, young and old. I think the term "best wedding band ever" was used more than once.They were also incredibly professional throughout the whole planning process. When I heard the Pop Fiction demos online I knew I had to get them for my wedding, and thank goodness I did! There were around 100 guests and I think probably every single one of them came up to me and told me it was the best wedding they have ever been to, and that was because of Pop Fiction! They kept everyone dancing all night, I even saw people who have never danced out on the floor! They helped make our wedding night so special, and their music was amazing. Kudos to Pop Fiction! You guys were just great! We couldn't have asked for anything better. You were flexible, you were fun, you kept the energy going, you got it...for everything that we wanted. As you know it was a dancing crowd, and you just kept that energy going. Thank you so much for helping to make it such a sucess! In every way, Pop Fiction is a home run. They've got it all, and what a pleasure to work with from an event planner's point of view. The customer service was a breath of fresh air - Dan made it clear that he would do everything he could to make the wedding day perfect, from conference calls, to meetings, to learning new songs, he went the extra mile. From the organized and courteous load in, to the ever present sound tech, the electrifying talent from stage, the list goes on and on - working with the enthusiastic Pop Fiction is a pure pleasure. I recommend them wholeheartedly. Thank you Pop Fiction...You guys rock! We had a fabulous time at our wedding - and you were a big part of that. You guys provided an unbelievably great show. Everyone is raving about it. You were the talk of our brunch on Sunday! for one of my client's weddings at the resort at squaw creek and I was happily surprised by their ability to literally get every guest up and dancing within seconds of playing their first song. It is not often that I see bands that can get everyone up and dancing and keep them dancing until the very last song. Their song selections were very custom to my client’s requests and they played them all perfectly. The lead singers' voices were amazing; the band was professional and every band member was a pleasure to work with. Thank you, thank you, Pop Fiction you rock!!! Pop Fiction was the life of our party! The band's performance blew everyone away! All of our guests said the band was excellent and everyone had a blast. The BEST part of our wedding was the band! We highly highly recommend them! They will be sure to impress! Pop Fiction just hit it out of the park at our wedding, but I'm sure you could tell by the energy of the crowd. We've had so many people come up to us and literally say that was the best wedding band they've ever seen. You guys did a great job, thank you so much, it meant the world to us. We had a blast. It was more fun than we ever thought it could be. You're a class act!" "One word on all: EXCELLENT!" "Everyone raved about Pop Fiction. They were fantastic and we would definitely hire them again. Bravo to all!"